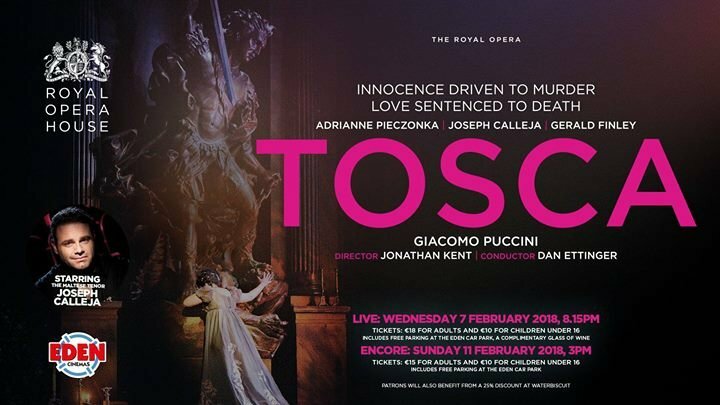 Experience The Royal Opera’s production of Puccini’s classic thriller Tosca, featuring Joseph Calleja, live at Eden Cinemas on Wednesday 7 February at 8.15pm, followed by an encore on Sunday 11th February at 3pm. One of the all-time great operas, Tosca combines drama, passion and glorious music. Instantly recognisable music from Tosca has been used countless times in film and television, most memorably as the soundtrack to an action scene in James Bond thriller Quantum of Solace. Set in Rome, the story follows painter Mario Cavaradossi who is captured and sentenced to death by Scarpia, the sadistic Chief of Police. Mario’s life can be saved and his freedom granted providing, his lover, Tosca, gives herself to Scarpia. This production is conducted by Dan Ettinger and stars the Canadian soprano Adrianne Pieczonka as Tosca. Local superstar tenor Joseph Calleja sings the role of Cavaradossi, alongside Canadian bass-baritone Gerald Finley, singing the role of Scarpia. Tickets for the live show include a complimentary glass of wine, nibbles, free parking at the Eden Leisure Car park and 25% discount at Waterbiscuit. Ticker for the encore screening include free parking and 25% discount at Waterbiscuit.